This is an affordable option to rent with a large impact on the overall look of the banquet room. We can place it around the perimeter of the room or use it to light up the head table in any colour of your choice. Uplighting creates a beautiful ambience and can make your space look more fresh and modern. This is the best and least expensive way to improve your decor and transform your space! Next, this is a great option to rent for small budgets, tight spaces, or small rooms. These types of lights provide ambience to the dance floor and party portion of the evening. Semi-intelligent lighting can also help define the dance floor, which helps guests feel more relaxed and in the party mode, which means your guests will have more fun! Lastly, this type costs a little more, but it gives the best coverage around the room. You can choose a variety of colours, we can program the lights, and they can pivot up to 360 degrees! This is an impressive look, and can be used as a spotlight for your introduction, speeches or first dance. We can pair the light with dry ice so you look like you’re dancing on a cloud! Custom gobos or monograms can be projected from intelligent lights. 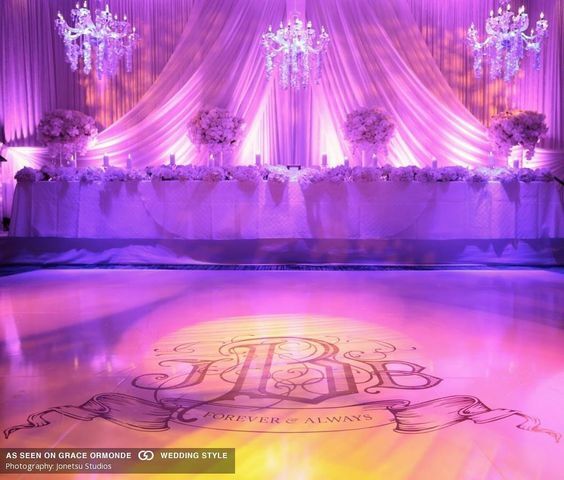 You could have a monogram of your initials projected on the wall or moving slowly around the whole banquet room during cocktail hour or dinner. They are a lot of fun on the dance floor and offer endless options to make your wedding look great. 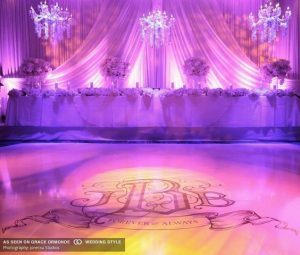 Lighting improves your decor, and ‘wow’ factor for your wedding as you can see at these venues in Oakville, Mississauga, Burlington and Milton. Overall it is the best way to improve your wedding venue, and create a beautiful, magical experience for your guests! Contact us to set up a time to meet at our Oakville showroom to demonstrate all our lighting options and find the perfect type for your wedding and event. Lighting makes your wedding venue beautiful!